Excellence is the Esprit de Corps you feel in your company knowing that you are a part of an organization that is well run and takes pride in the products or services they provide to customers. Excellence is an attitude and a way of life. Words like "can't", "good enough", and "that's the way we've always done it" are banished from the corporate vocabulary. Excellence starts with quality leaders who are focused on strategic vision for the company. The vision is shared across the organization and employees are empowered to help realize the vision. It is not enough for leadership to say, "Do this". They must explain why, then give the employee a set of business objectives to achieve. Telling someone what to do is not leadership. Asking for their help in achieving clearly defined business objectives then supporting them by removing obstacles to their success. That is leadership. What happens when leadership fails to lead? We see poor leadership manifested in many ways. One of which I call the "Golden Child" syndrome. One person becomes the "go to guy" for the organization. This happens because workflow processes and roles are not clearly defined and employees are not empowered to make decisions within their limits of authority. Everyone has to take every decision to the "Golden Child" who will make a unilateral ruling on the subject, often flippantly, without considering all the ramifications of their decision or who may be harmed by it. 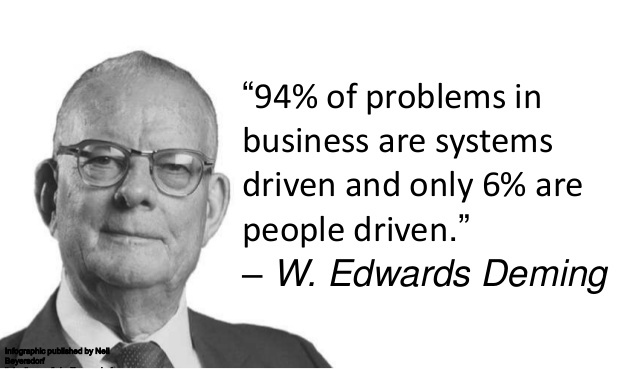 These are the people who wrongly believe that silos within an organization will protect them from any fallout. The "Golden Child" will eventually fail, burn out, or find themselves promoted to their level of incompetence. As the quote above says, "asking more - from fewer" is the goal of a most companies. Having a fewer number of highly motivated employees with well defined processes and roles will always be better than having a bunch unmotivated employees who don't have a firm grasp on what it is they are supposed to be doing. I've personally witnessed organizations staff up by hiring hundreds of individuals and only a few people in the organization knew what they did, when to interface with them, what their areas of responsibility were, what their process are and what the inputs and outputs of those processes are. 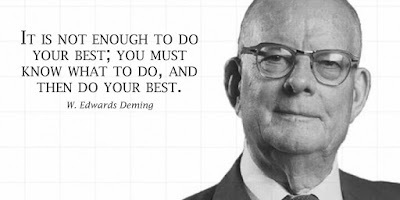 Dr. Deming's quote above is one of the biggest issues in American business that goes unchanged in large organizations. He's not referring to computer systems, he's talking about business processes and workflows. When leaders don't focus on delivering excellence through clearly defined workflows, processes, and procedures; it is very difficult to provide excellence. How can employees be expected to do good work when leadership hasn't defined what "good" looks like? They are forced to work hard, not smart. With the lack of defined roles, workflows, policies, and procedures a vacuum is created in the organization which creates an environment that is filled by employees who feel as if they need to "get things done". Individuals making unilateral decisions without the involvement of all stakeholders can end up creating the "Golden Child" syndrome. Poor leaders often see this employee as "dedicated" and "hard working" and do not realize the damage they are doing to the organization. Other top employees will eventually discover that their knowledge and experience is always usurped by the Golden Child employee and they will begin to stop contributing. Once those employees are silenced, they will begin seeking other opportunities or they will give minimal effort in order to keep their job. This leads to scores of "busy" employees who have no firm direction on what needs to be done. Duplication of work becomes an issue. If you are in an organization chock full of Golden Children with no clearly defined goals and objectives you're probably very frustrated and feel undervalued. If you have marketable skills, you will eventually leave. This cripples the organization as they are left with only those employees in need of development which thereby creates more dependence on the Golden Child to do all the work and make all the decisions. If you are a leader in an organization and find yourself with a Golden Child, make sure you clearly define their role and limits of authority to rein them in quickly. They will be intent on doing everyone's job and will often brag about the number of "hats" they wear. This is deadly in an organization. Move to define functions and roles for each business service and identify service owners and managers. Empower employees to make decisions by providing them with clear objectives. Don't let the Golden Child rob your organization of its top talent and cripple your company.